Meeting planners and event planners can tell how much you charge for a speaking gig, how good of a speaker you are and if you know the speaking game…all by looking at your website for only 10 seconds. My answer to that is to supply an organized planning document for your designer to work from. I call it a “website pre-flight” document. For the first time ever, I’m making my website pre-flight planning document for professional speaker websites available to the public. I used this document with every new speaker client whether my team designed their speaker website or the speaker already has a designer in mind. Why Purchase the Website Pre-Flight Planning Document for Speakers? The document will teach your designer what meeting planners and event planners are looking for so you don’t have to. It will also introduce your designer to the professional speaking industry answering questions they might not know to ask. Your designer will NOT have to go through 15 revisions to make the design you want…even if you don’t know what you really want. Your programmer will NOT come back to you wanting more money to finish the job because you had not clearly outlined the project. Your website development turnaround time will be reduced by roughly half than if you were to not use this specific of a planning document. Your website WILL appear higher on search engines faster than it ever has before because your pages are optimized as part of the design process instead of months after-the-fact. Your website will convert more visitors to speaking gig leads because you have clearly defined for your designer exactly the kind of visitor you are targeting. What is the Essential Website Pre-Flight Document? Save money because your designer will be able to quote your project accuratelythe first time around. Save time because you will focus your energy on answering the questions rather than trying to think of the questions you should be asking. Enjoy faster return on your investment because various Internet promotion techniques are integrated into the pre-flight process. How Does the Website Pre-Flight Work? It’s simple. The Website Pre-Flight Planning Document for Professional Speaker Websites is an MS Word document that you download to your computer after your order is placed. 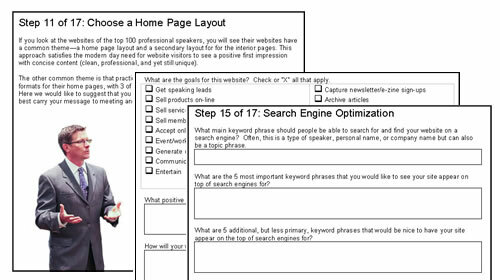 Step-by-step, you are to answer the questions related to your speaking, book, business, target audience, speaking topic focus and design desires. With these questions answered, you can easily hand them to any web designer to show them exactly what you’re looking for in your speaker website design and layout. Of course, that’s a very very basic overview of the process. Our website planning document for professional speaker websites will guide you step-by-step through getting those questions answered. Here’s a visual sample of what you’ll get. If I had to sit down with you to personally go through these questions and help you develop the answers, you would have to pay me more than 5 hours in consulting time which would be more than $1,000! Get Immediate Access to this 20-Page MS Word Document where you can type the answers, customize the questions, add new questions and save to your computer for distribution to design companies for bids. Just $27! We look forward to hearing how our Website Pre-Flight Planning Document for Professional Speaker Websites has helped YOU with your project. P.S. Are you a designer or developer with a new professional speaker website client and don’t understand the speaking business? Or are you a speaker and don’t know how to talk to your designer or developer about your website? Marty is available for project consulting.